Celebrating Earthday is no small matter in New Rochelle Trinity Elementary School. Assistant Principal Michael Hildebrand scheduled presenters from We Future Cycle for all Kindergarten through 3rd grades and the school was positively vibrating with good energy. In class by class presentations, second graders learned concepts of what materials can bio-degrade and what that means in terms of this material entering our environment. They learned about decomposition, seed germination and a touch of the chemical processes behind that. Students had the opportunity to be hands-on scientists and explored how different materials interacted with water. quite messy in fact, but also eye opening to learn and experience that plastics are not changed by water, other than broken into smaller plastic pieces over time, until they are small enough to enter the food chain. Watching a heart wrenching short movie about how wild life is affected by plastic in our environment started a spirited discussion on what each and every one of them can do to solve this problem. Students decided to become vocal to educate other about the problem. Check out these fabulous posters as the result. These are mini-environmentalists on their way to become agents of change. Way to go! Being in an elementary level lunchroom is not for the faint hearted. The noise level is deafening. But fearlessly, We Future Cycle set up the Lunchroom Environmental Scavenger Hunt in New Rochelle Trinity’s lunchroom. As 3rd graders came in, they bee-lined to the colorful posters, all depicting shocking data about environmental problems surrounding them. They open mouthed stared at pictures of turtles eating a floating plastic bag while trying to figure out what a trillion plastic bags per year in the world actually means. And they are not alone, it is a staggering number that nobody can really wrap their head around. Students that wanted to participate in the game were sent to eat first and then come and get a detective sheet. In order to answer the questions, students had to study the poster boards carefully and they were all game to play. And as they worked (quietly, there was a marked noise level difference), they learned and shared with their friend the surprise about some of these staggering facts. The US alone uses 500 Million straws every single day! Rye Town just joined “The Last Straw” Campaign. Everybody can make a difference by ditching straws, replacing single serve plastic bags and being good about recycling all appropriate materials. They also learned about the dismal recycling rate of single serve plastic bottles. These kids are old hands in recycling and they asked me why not everybody was just recycling…. Good question, indeed. Under the leadership of Assistant Principal Michael Hildebrand, New Rochelle Trinity students are able to participate in school wide Earth Day activities and are loving it. 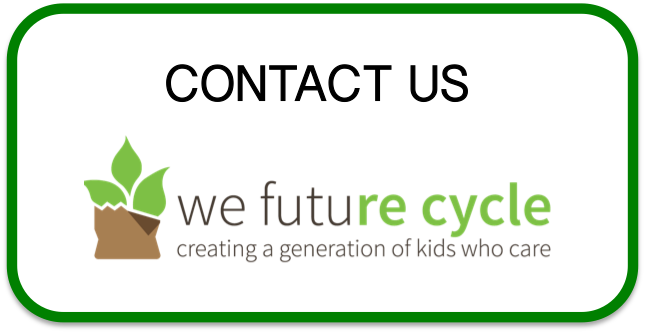 A team of We Future Cycle presenters descended upon the school and had great fun introducing kindergarten students and first graders to worms and worm composting. The key to environmental literacy is sustained education around different aspects. Trinity elementary students are old hands at sorting in the lunchroom, being the longest school on board of the We Future Cycle recycling program. Flawlessly they separate commingled from food waste and from remaining trash. And with the never wavering support of the Trinity administrations, students are treated regularly to environmental education and they are loving it!. Today’s classes were suppose to be 45 min, but often, I did not get out of there until 1:15 min because students had so many great questions. This is how future environmental leaders are made.